﻿Eid al-Adha: Calendar, History, Tweets, Facts & Activities. Eid al-Adha (Arabic: عيد الأضحى) commemorates Prophet Abraham's willingness to sacrifice everything for God, including his son, Ismael. God became impressed with Abraham's sincerity, and gave him a ram to sacrifice instead. For that reason, Muslims who can afford to do so also sacrifice an animal on any one of the three days of Eid al-Adha. A third of the meat is kept, a third is shared with family members, and a third is given away to needy people. Eid al-Adha is a time of sacrifice for Muslims. It is the day after Arafah (9th of Dhul-Hijjah on the Islamic calendar). It begins on the 10th of the month and lasts for three days. This is the second main annual festival in Islam (the other being: Eidul Fitr). Unlike regular prayers, prayers for Eid al-Adha takes place in any large, open field. There Muslims from many mosques congregate together. 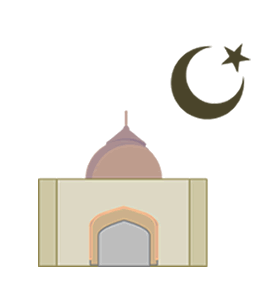 Usually, mosques collaborate together to find a field that is convenient for everyone to go to. In the United States, Eid prayers often occur in parks. It is customary for Muslims perform a ritual body washing shower, called "ghusl," before walking to the place of prayers. This is in accordance with the tradition of the Prophet Muhammad. Often, a large party is thrown by Muslims on one of the three days of Eid al-Adha. Meat from slaughtered animals is served. It is customary for Muslim men who have lost loved ones visit graveyards on Eid al-Adha. It is Islamic tradition to wear your most beautiful clothes on the first day of Eid al-Adha. A few days before Eid al-Adha, Muslims shop for their new Eid clothes. Merchants in Islamic countries often hold their biggest sales before Eid al-Adha. On this day, as part of the Hajj, pilgrims in Mina begin to cast stones at three walls representing the devil. The stones are thrown in a specific order. The ritual must be done the following two days as well, or three if the pilgrim stays for that long. This is a re-enactment of when the devil appeared before Abraham three times during his pilgrimage.